Melvin Patterson was quite the find. Since his time in the WLAF he’s tread a very unique life. After a lot of cross referencing his football card to a variety of other sources I found an old post on the web imploring users of the designer drug Kratom to contact Patterson at the DEA. After a few months of soul searching, I decided to reach out to Melvin. It had taken me sometime because I was intimidated to be calling the D-E-A. Furthermore, what would his reaction be? Finally, for me it breaks a long standing rule and tradition of TTM requests to never contact the player directly. Mail is direct enough, but by phone- that is a higher level of communication and it could be construed as something alarming. Nonetheless, I went ahead nervously and gave it a shot. Initially it was a rough call. I could read easily that Patterson’s tone was skeptical, but after stumbling through formalities and explaining the purpose of my call, my link to him through the WLAF, and how it had positively impacted my life, he opened up to me and we had a long and interesting conversation about the league. It was really enlightening for me, as most of my discussions with former players usually is through snail mail, and I could get knee jerk, honest answers immediately about Melvin’s time playing for the league from him. I also was able to reassure him of my purpose by being able to discuss these things at length with him, especially the infamous ‘Hail Storm Game’ that occurred between Ohio and San Antonio. He shared with me that the game held significant importance for him as both his mother (who frowned upon him playing football because she was afraid he’d get hurt) and his future wife were in attendance at the game. Melvin also shared with me the background behind his 99 yard TD grab against the Knights- the longest in league history. Apparently they had tried the same play on the previous down, and it hadn’t worked. While in the huddle, Melvin was chirping in QB Pat O’Hara‘s ear about how open he had been for most of the game. They decided to attempt the same play again, but flip it. O’Hara went back to pass and Melvin found the seam between the corner and the safety and before he knew it, the ball was in his hands. He split the defensive backs and stepped on the gas to take the ball to pay dirt. Patterson also reminded me of the SFA connection and that many players including Patrick Action Jackson and Todd Hammel had made their ways through the WLAF. He was very curious in how his teammates and college players had been doing. Melvin said he’d even put in a good word for me if I could track down Todd. Like many players, he agreed that the NFL gave up on the WLAF (and its other incarnations) too soon, as we rattled off the lineage of players that went on to greater glory or have become coaches in their own right, thanks in part to time honing their skills in the league. In addition he told me he had been assigned to the Austin field office for a few years during his tenure at the DEA, and this was quite a charge to me, just reinforcing what a small world it is. In 1987, Melvin led SFA with 31 receptions for 472 yards and 2 TDs. Melvin signed with the Dallas Cowboys as a Free Agent in 1988 and the Atlanta Falcons in 1989. He joined the WLAF in 1991 as a 5th round pick of the Birmingham Fire. Based on archival information, it appears that Melvin was a member of the Raleigh-Durham Skyhawks at the end of 1991, finishing with 4 catches for 126 yards and a 72 yard long. 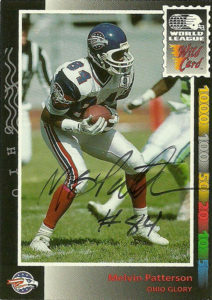 Patterson was signed by the Eagles and allocated back to the WLAF for 1992. He was selected by the Ohio Glory in the supplemental player draft. To say that the Glory suffered an identity crisis on offense is an understatement. Not only was there problems at quarterback, the coaches argued over the philosophical offensive strength of the team. Still, Melvin managed to haul in 21 receptions for 395 yards and 2 TDs as a long bomb threat. I’m sure that his mom shuddered every time the defense forced a punt, as Melvin was the team’s primary returner with 25 returns for 173 yards. These are some great cards of Melvin. The photography for the Ultimate set was uneven, but with this action shot of Melvin was pretty solid. Even though he doesn’t have the ball, the photo is at the right distance and the framing is just right to make this shot stand out from the ordinary. The second image from the Wild Card set is a nice one. You can feel the ball hitting Patterson in the bread basket. I wasn’t the biggest fan of their design however. I thought the stamp logo and the bright numbers down the side really took away from the main composition of the card. Melvin has pretty much been a career man in DEA since football and is nearing retirement. He wrote me a really nice note with the autographs he sent back to me and said that he gets requests every once in a while from fans for autographs. Of note, Melvin’s gaudy receiving average of 20.8 ranks 4th in league history.